Taos, New Mexico is a cute little town about an hour north of Santa Fe. 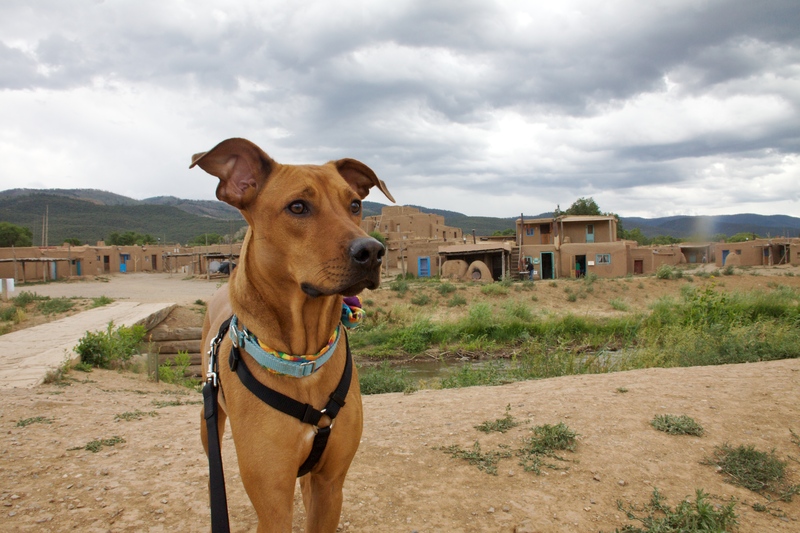 Taos is the home of the Taos Pueblos who have lived on their land for over a thousand years continuously and have never been relocated as so many native americans were in the 1800s. The pueblo is also a World Heritage Site by UNESCO and a National Historic Landmark. 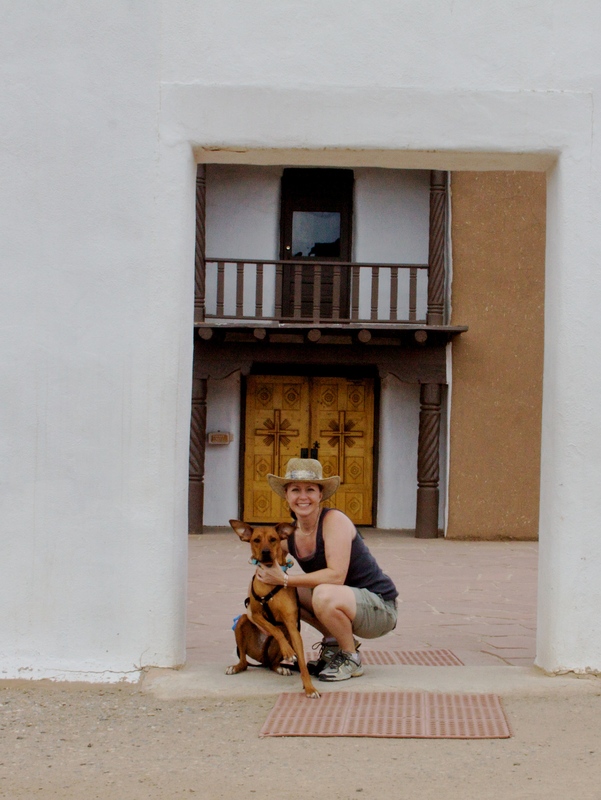 Mom dropped me off at the motel but returned a couple of hours later with a surprise… I was going to tour the pueblo after all. She said one of the men who lived on the Pueblo told her that she should bring me back. Yippee! So off we went back to the Taos Pueblo. By the time we arrived back at the pueblo the dark storm clouds were swirling and I was still a little scared what with the drums beating in the distance, but I stuck it out. 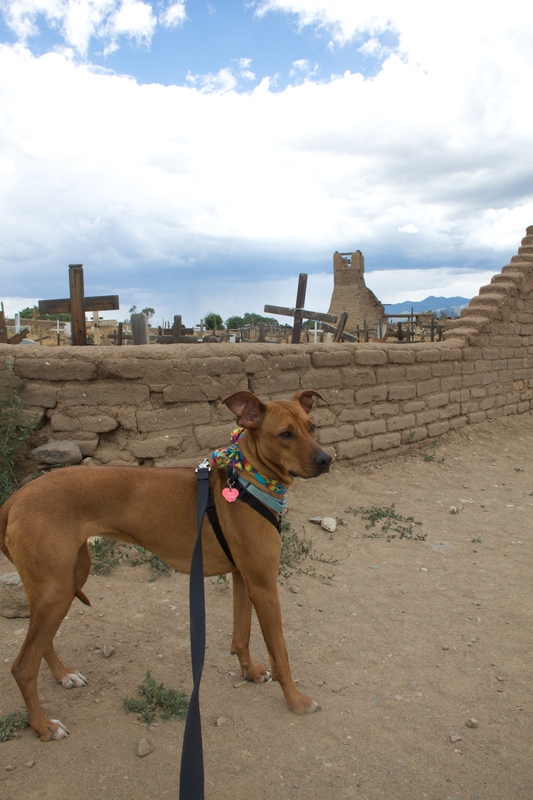 I got to see the old cemetery and the new church and an actual native Taos Pueblo man asked to meet me. Some of the tourists stopped to take my photo – wow I am a star! Mom took me by the original dwellings that are still inhabited today. Those structures are over 1,000 years old. So very cool! I saw several other dogs laying about in the dust trying to keep cool, but I was so shy. We stopped in front of the new church and mom asked this nice man to take our picture. We walked slowly back to our truck to head out. I was so thrilled that I had just walked on ancient sacred land. So very cool!